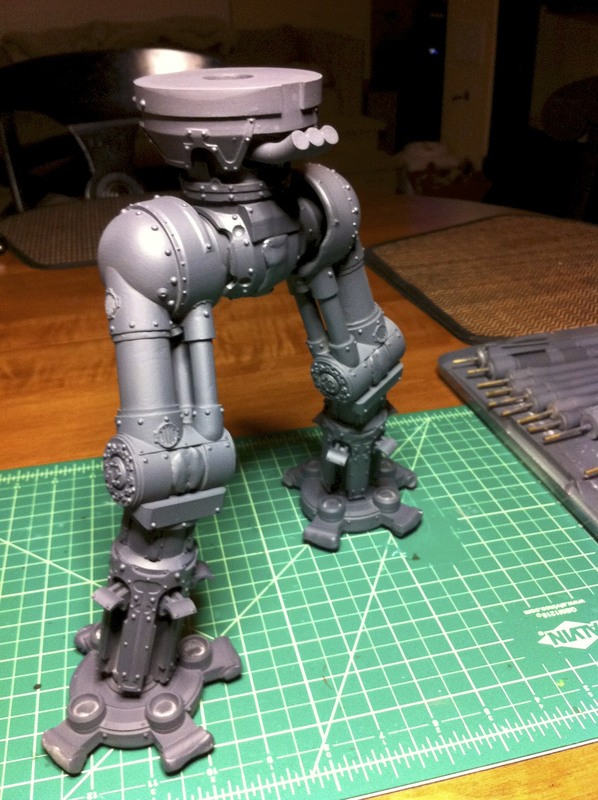 Building the Forgeworld Reaver Titan Legs | 30mm Madness! Test fit everything so you know what is what. Take your time here. Decide on your pinning strategy. Expand the below image to see where I decided to put pins. 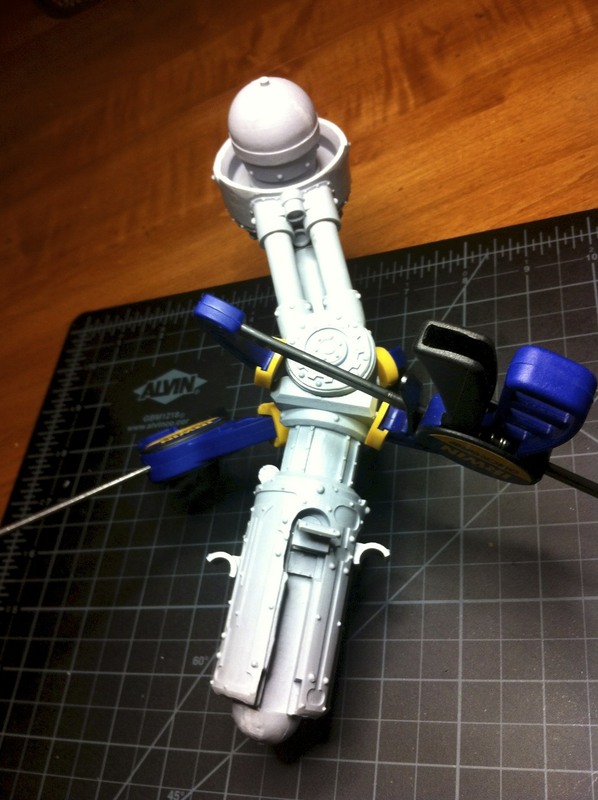 I started by pinning and glueing the hip (ball joint) into the thigh. 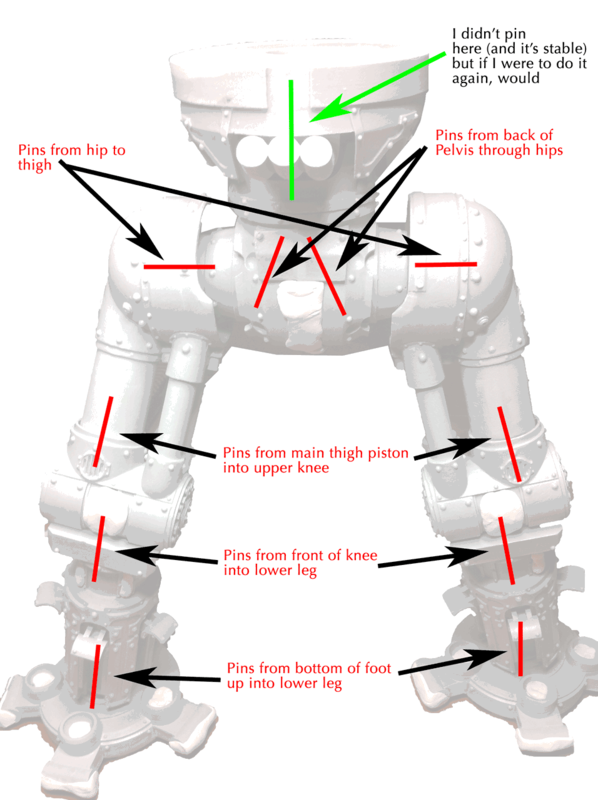 For all leg joints I used full strength JB-Weld, which is why you’ll see a lot of ‘let dry overnight’ in the below steps. 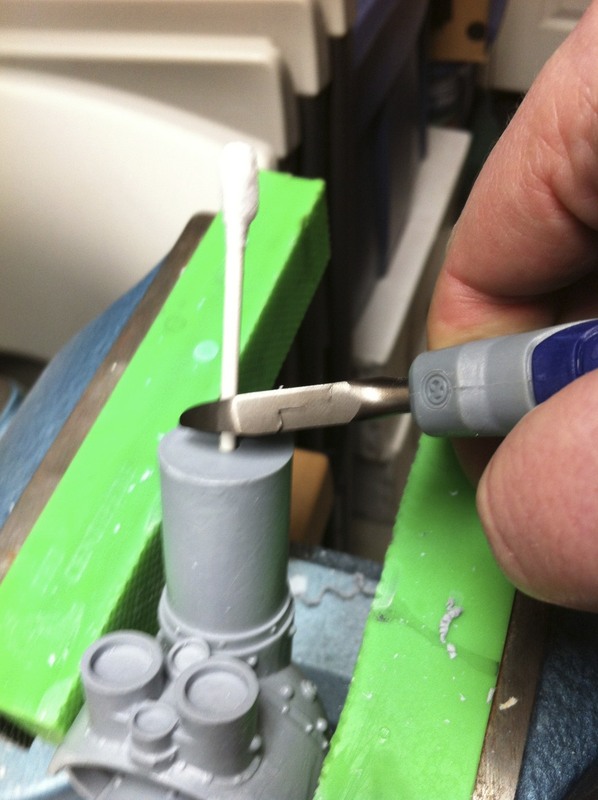 You could *probably* get a way with 5 minute ‘JB-Quick’ as the adhesion strength is the same between the two, and adhesion to resin is probably the weaker link (between that and the actual strength of the epoxy itself). Test fitting the thigh to the knee, the day after the hip had been pinned and glued. 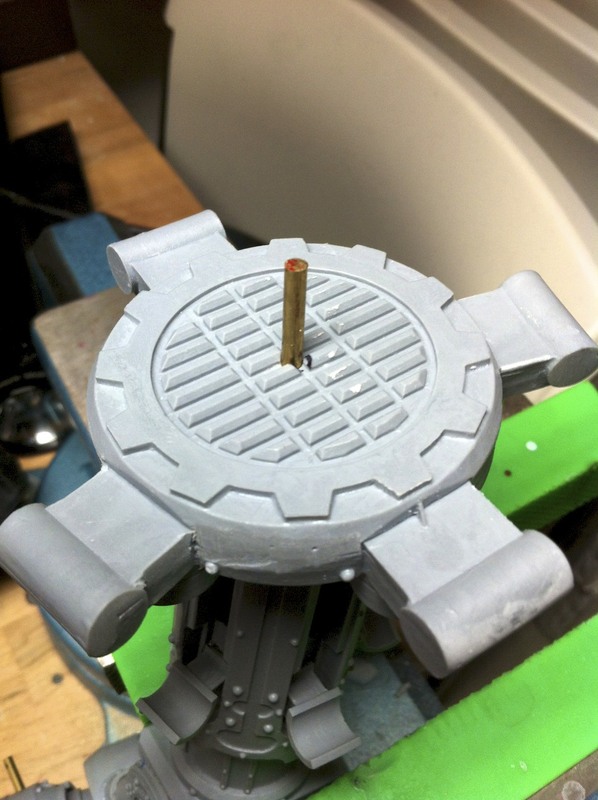 To pin the knee to the thigh, I started by drilling a hole in main hip piston, and then using a Q-tip with some paint on the end to mark the spot to drill on the knee… then I drilled a hole for the pin in the knee. 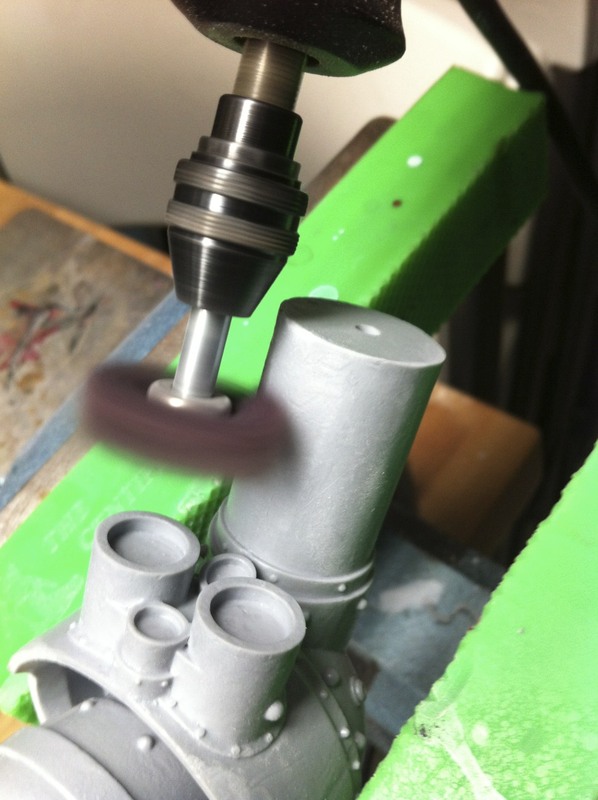 I then buffed the piston with the Dremel fine grit buffer, as I’m going to go for a smooth, relective surface like I did with the other small pistons. 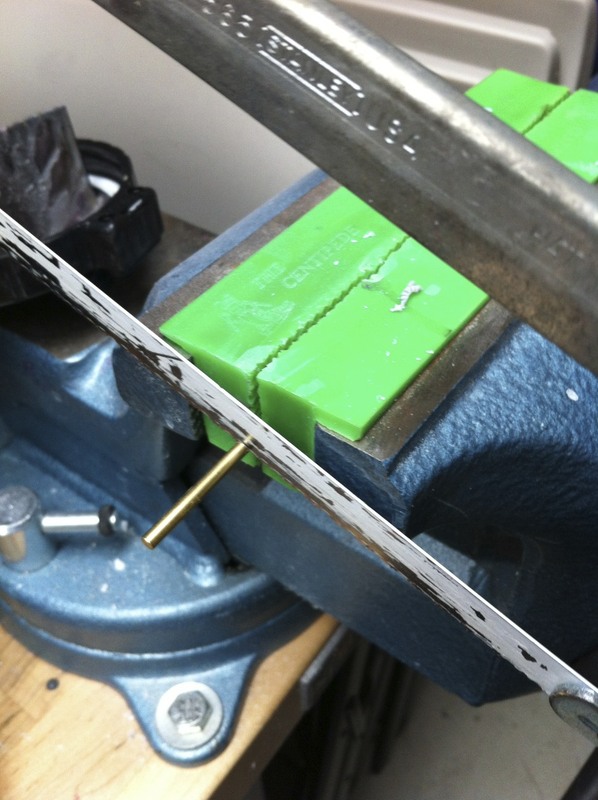 Next, I measured the depth of both holes, and cut a piece of brass rod. 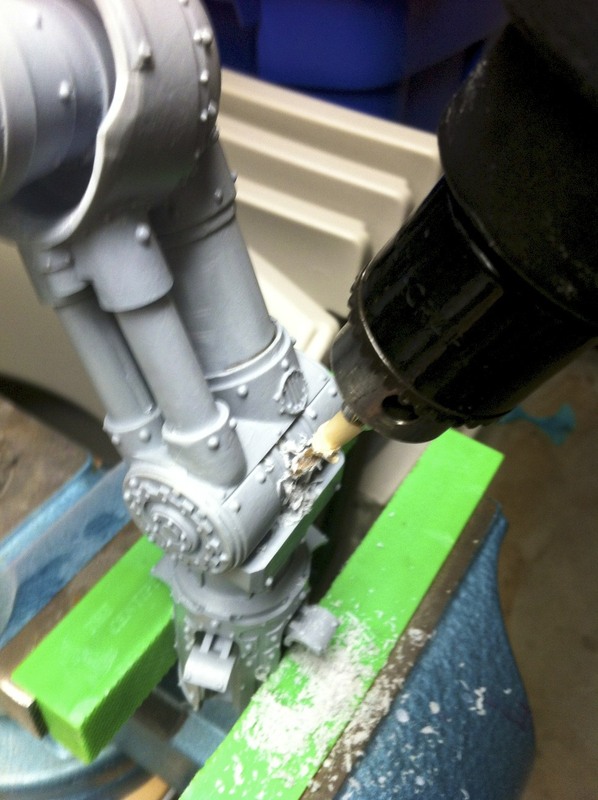 For the major leg assemblies I ended up using just over 4 feet of 1/8″ brass rod, and drilled using an electric hand held drill with a 1/8″ bit, ‘wobbled’ in the hole a bit to make room for the jb-weld. Finally, after test fitting again, I mixed up some full strength JB-Weld, coated the brass rods and joints, assembled the pieces, cleaned up any extra JB-Weld extruded after assembly with a paper towel, and let cure overnight. After that has dried, it’s time to decide what angle you want the knees at… I used poster tac, which allowed me to precariously ‘tack’ everything together to get an idea of general leg position. In the picture below you see my test pose… I later decided that the legs going straight down looked silly and probably wouldn’t be as stable as a wide stance. I did learn that I wanted a shallow angle knee angle, say 150 degrees (or 30 degrees, depending on how you’re looking at it)… and that most of the leg position comes from how the hips are attached to the pelvis and thusly how the feet are attached to the ankle… so as long as you’re not doing a crazy dynamic pose, a slight bend in the knee will allow you to do quite a few natural stances. Here is the test fit, this stance was too narrow and I ended up going with a wider stance. Another view of the knee curing overnight. Knee being glued at shallow angle, clamped and curing overnight. After the knee cured overnight, I drilled 1/8″ holes through the front of the knee (will be behind the knee pad) at an angle that will send the pin down into the top of the lower leg. 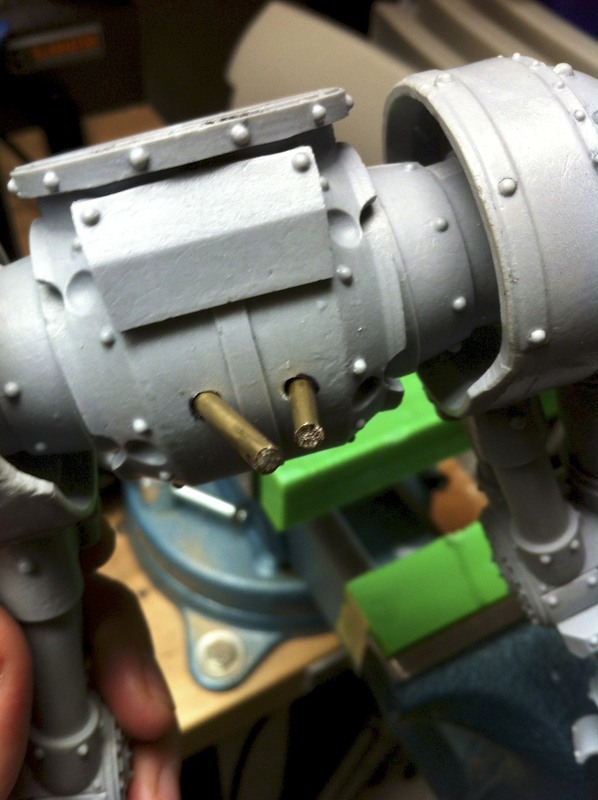 I then coated the brass rod of appropriate length with JB-Weld and inserted the pin. 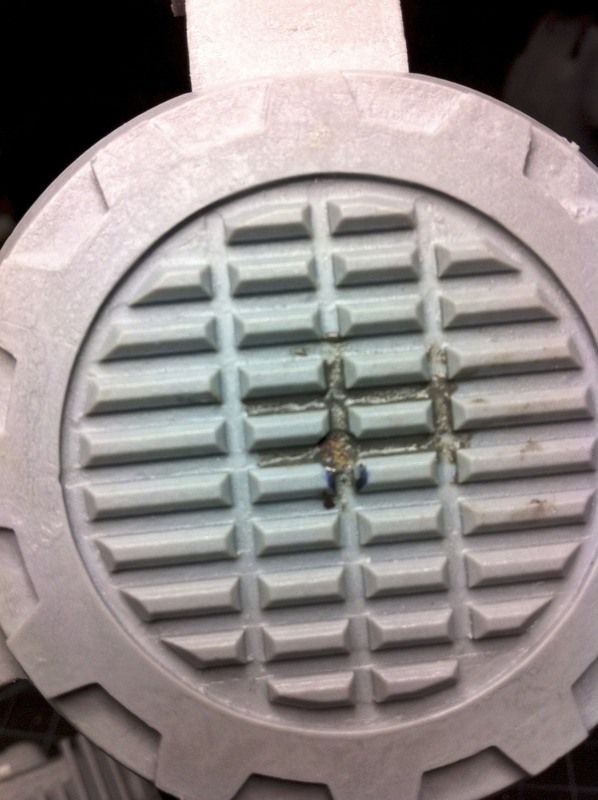 I marked the depth of the intended hole with masking tape on the drill bit, and drilled away. Here, the brass rod is being inserted into the hole in the knee/leg. To get the rod fully in, use something ‘pokey,’ then clean up the excess epoxy with a clean paper towel, so the knee pad will fit snugly. After pining the knees (no need to wait for the JB-Weld in the pins to dry as there is enough strength in the knee w/o it) The next step was to secure the hips in the Pelvis. For the join, I first roughed up the balls and sockets with a hobby knife (Be careful!) and used a very even yet thickish (maybe 1mm) coat of ‘JB-Quick.’ I then held the legs/sockets/hips/pelvis in place, sitting on un-glued feet, for about 10 minute or until the epoxy set. The reason I used ‘JB-Quick’ instead of ‘JB-Weld’ is that positioning is relatively critical, and there is no easy way to clamp the rounded surfaces together without risk of movement while waiting 4+ hours for the epoxy to set. 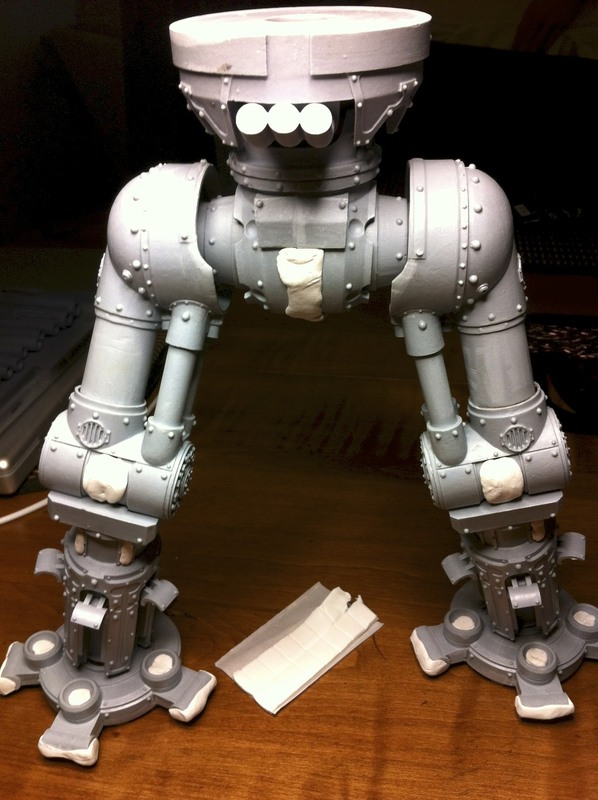 After the glue set, I SET DOWN THE LEGS and walked away. The full strength of even JB-Quick isn’t achieved for about 4 hours. 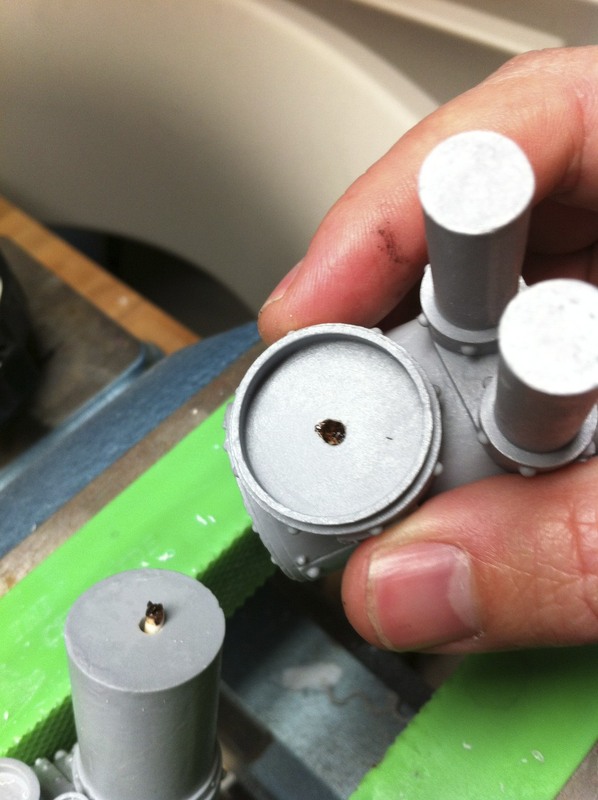 The next day, I drilled two 1/8″ holes from the back of the pelvis, at an angle to hit the ‘meat’ of the hip… and then used regular JB-Weld on the brass rod and slid them into the drilled holes. I then repeated the ‘JB-Quick’ type join from step 10 above with the feet. 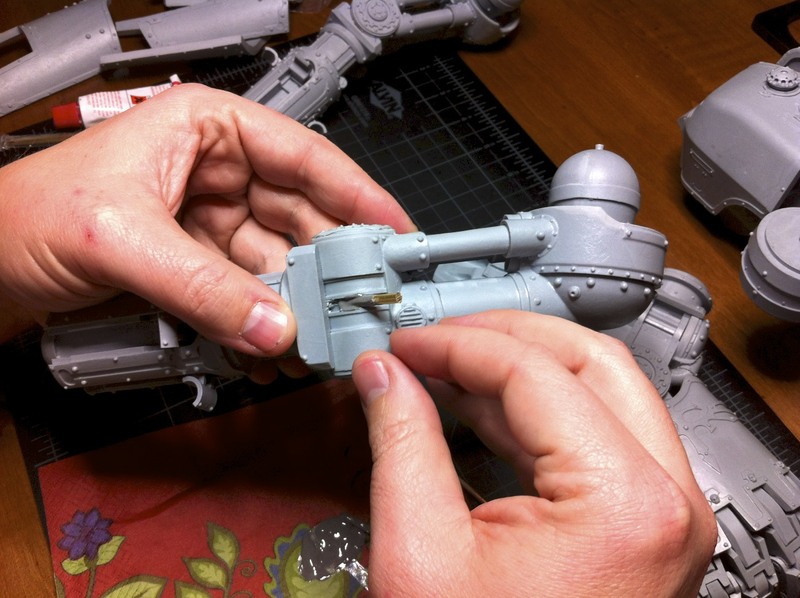 For a stable titan the feet must aligned to a flat surface, so I wanted the faster cure time of the JB-Quick while being held. 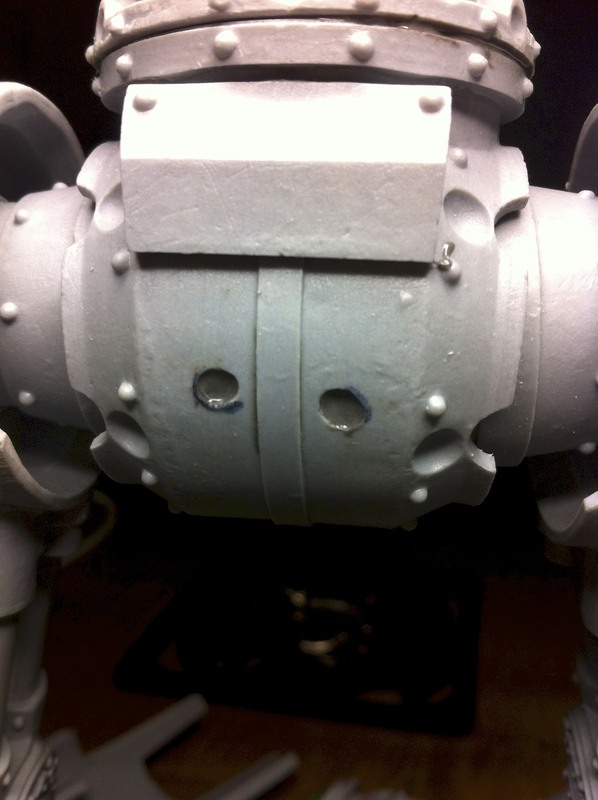 After the feet had fully cured, I drilled and pined the feet as well. You can find the exact center of the foot by counting the treads. At this point I installed the waist. After trying several different poses I decided to go with a ‘straight facing’ waist. I chose full strength JB-Weld, roughed up both surfaces, and let cure overnight. I chose not to pin this join, as it is a flat join with lots of surface area and it shouldn’t be subject to much torsion. Hopefully I don’t regret skipping the pin in this step later! 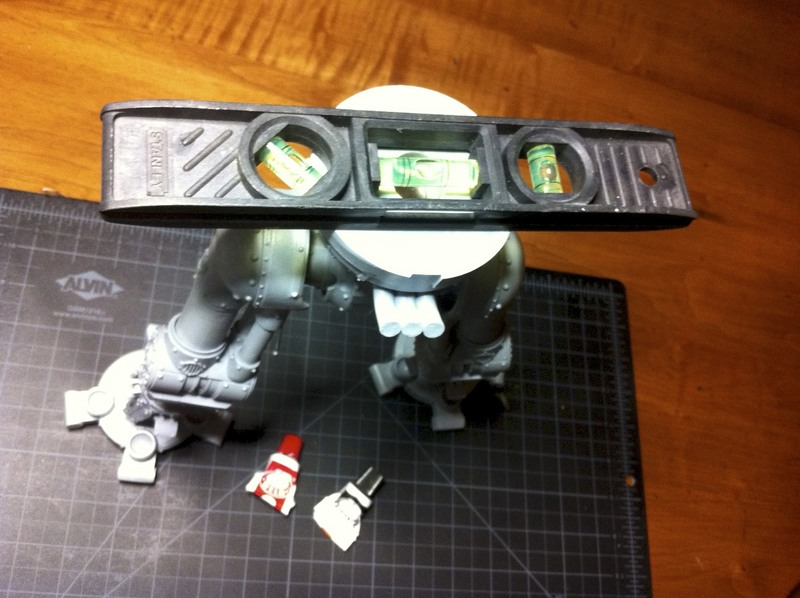 Finally, after the waist was cured overnight, I installed the lower torso. I roughed up the surfaces and cured with JB-Weld. Because I had already installed a magnet in the lower torso, there was no easy place to sink a pin, so I went without a pin here and let cure over night. In my case I wanted a level main torso so I leveled it and simply let it sit overnight. If I were to do this over again, I would pin right down the middle of the lower torso, through the waist, and into the pelvis, adding lots of strength to those three joins…and THEN install the magnet. 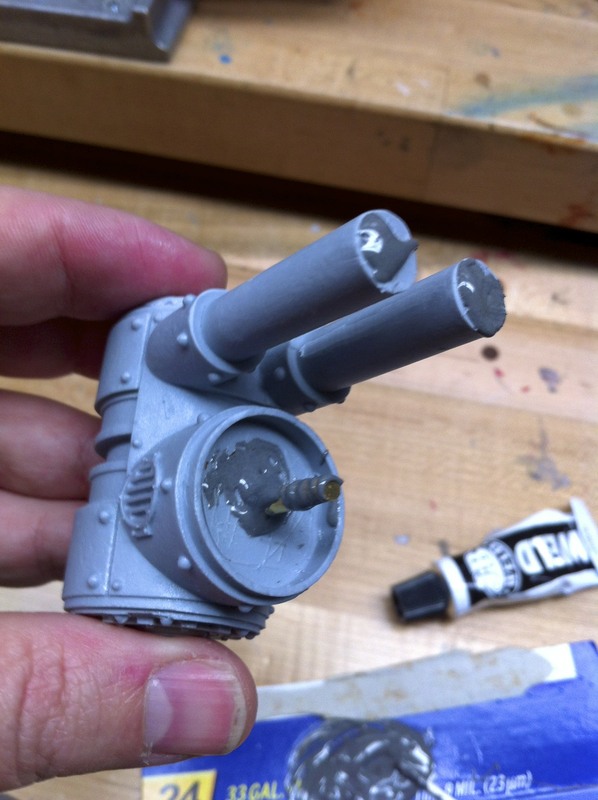 At this point it seems like the JB-Weld epoxy is so frikken’ strong that no pins are probably needed at all, but with a model that costs this much overkill is the name of the game. It’s been several days since all the joins have fully cured and there is absolutely no play or feeling of fragility what-so-ever in the leg assembly…feels completely solid. At this point I would recommend installing leg piston mounts and knee piston mounts. 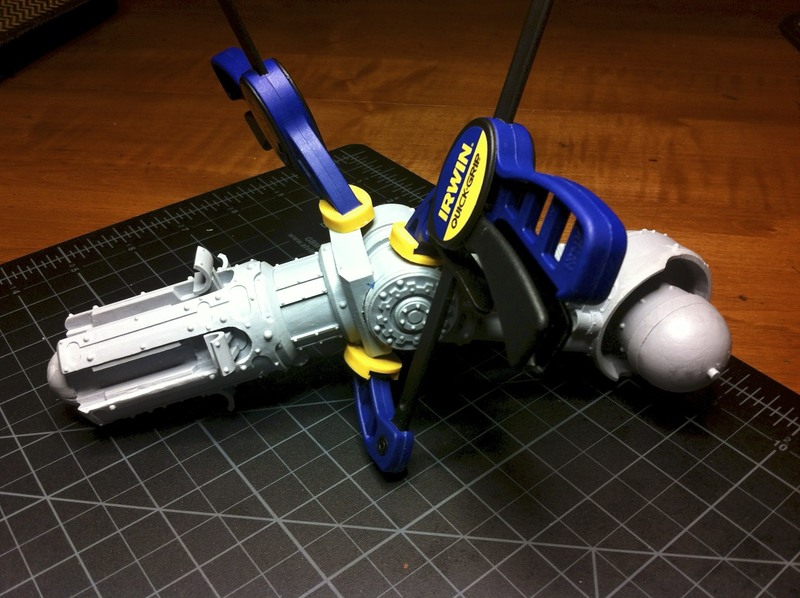 I installed them earlier and while handling the lower leg actually snapped off one of the leg piston mount ends. Super glue quickly remedied this (and the bond was surprisingly sturdy) but… I’d recommend keeping the little parts off until the big pieces are all completely fit/glued/pinned. 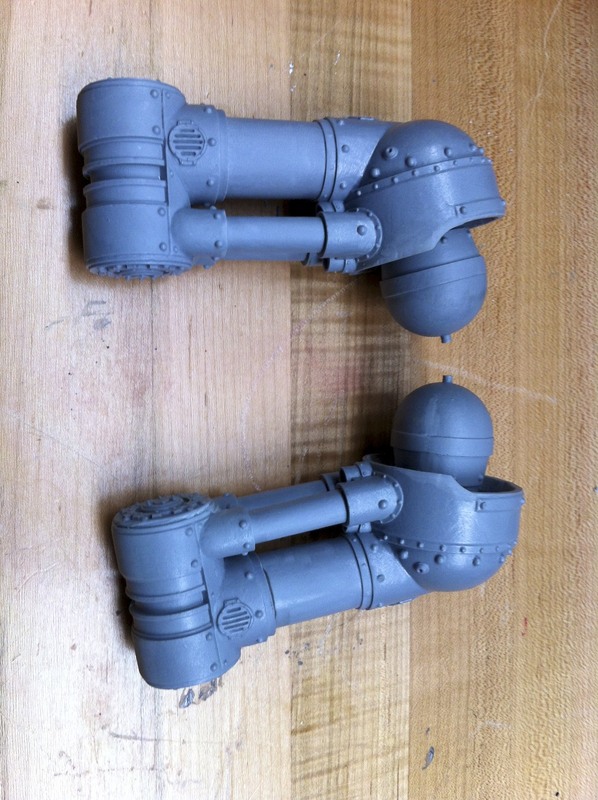 Next, I masked off areas that will glue to armor plates, let pistons, etc. with some poster tac. 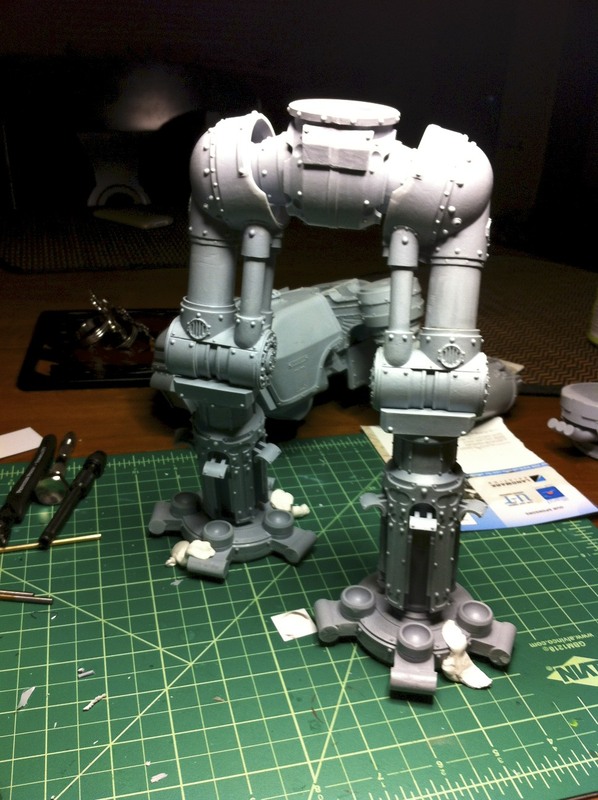 And finally, I primed the leg assembly! 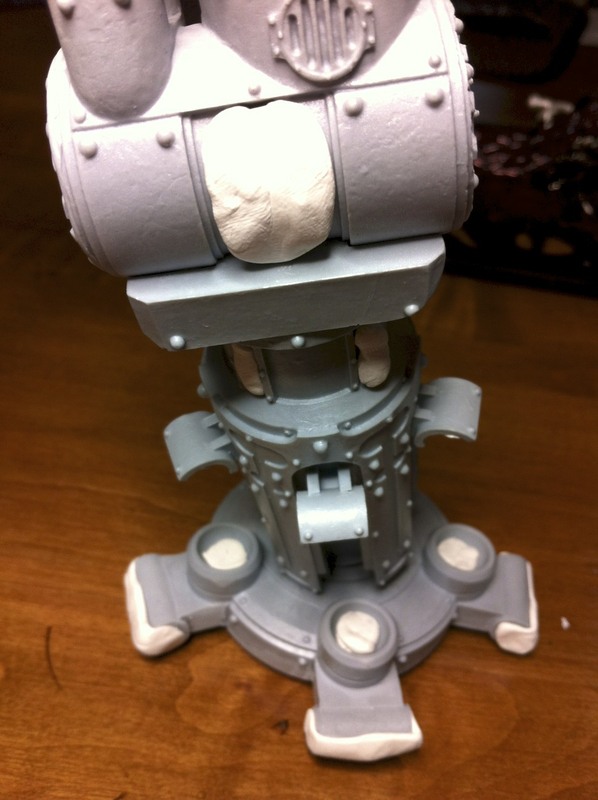 I used Duplicolor ‘Hotrod Grey’ sandable primer. The washing multiple times during cleanup payed off here, as I had perfect primer adhesion, which I tested by rubbing a fingernail in an inconspicuous area…and while I burnished the primer a bit, the paint adhered nicely and I was unable to scratch any off. And that concludes the leg build! 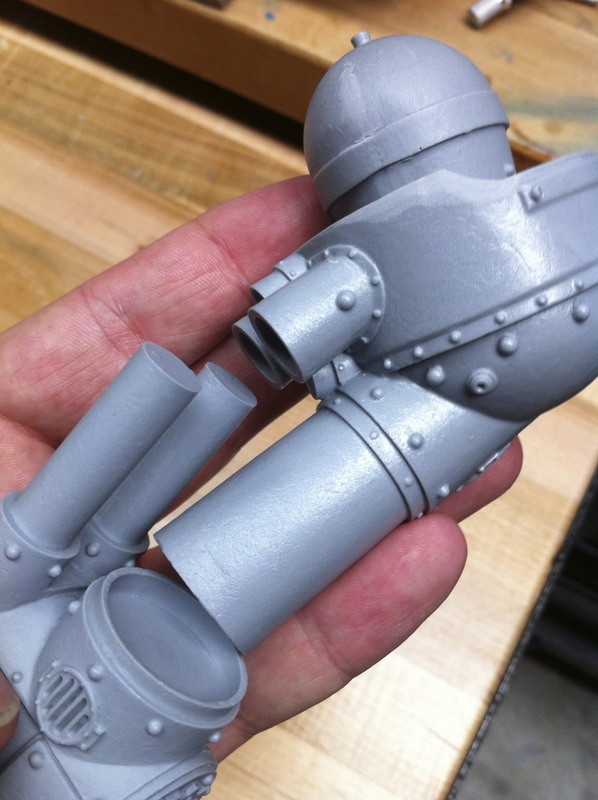 I’ll cover installing knee/lower leg armor, toes, leg pistons, and piston guards in a different post… I chose to not install any of the outer leg gear so I have easy paint access during painting. This entry was posted on January 29, 2012 by justinhardin. 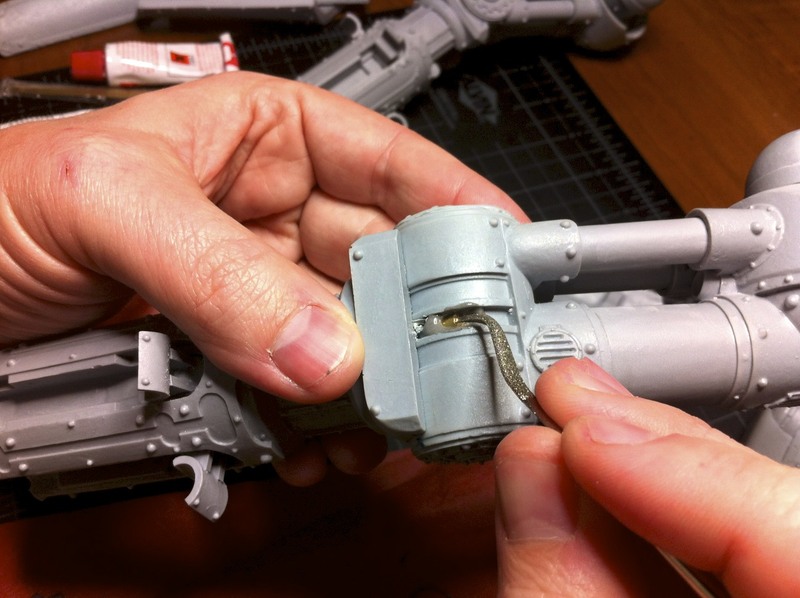 It was filed under Legio Titanicus, Modeling & Painting, Warhammer 40K .